NEW YORK (AP) — Bob Woodward's "Fear" is spreading quickly. 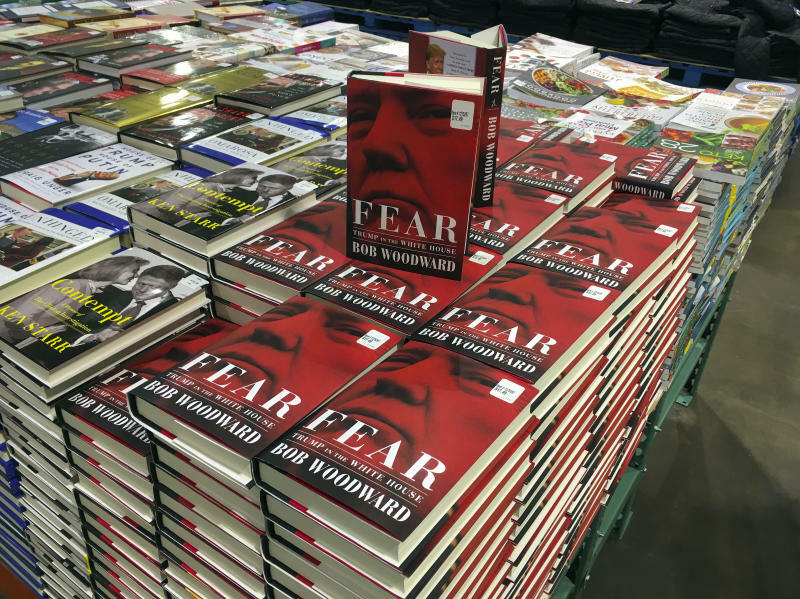 Woodward's account of a dysfunctional Trump White House has already sold more than 750,000 copies, Simon & Schuster announced Wednesday, a day after the book arrived in stores. "Fear" is virtually assured of joining Michael Wolff's "Fire and Fury" as a million-selling takedown of Trump. The pace of sales, which include print, e-books and an audio edition, is among the fastest in memory for a nonfiction work. In 2004, Bill Clinton's memoir "My Life" sold more than 1 million copies within eight days. "Fear" has dominated political headlines since reports about it emerged last week. The book portrays Trump as an ill-informed and dishonest president and the West Wing staff as trying to minimize the damage. As with "Fire and Fury" and other anti-Trump books, the president has condemned "Fear" as false. Some former White House officials who spoke with Woodward have tried to distance themselves from the book. The president's son Eric Trump appeared on "Fox & Friends" on Wednesday to denounce the book and was lambasted by critics for his choice of language. "You can write a sensational nonsense book. CNN will definitely have you on there because they love to trash the president," Eric Trump said. "It'll mean you sell three extra books, you make three extra shekels." The reference to "three extra shekels" drew criticism from people who believed it had anti-Semitic undertones. Woodward is not Jewish. Woodward, since becoming famous in the 1970s for his Watergate reporting, has written several best-sellers about sitting presidents. "Fear" had more preorders than any other book in Simon & Schuster's history, according to the publisher, which has previously released such best-sellers as Hillary Clinton's "Living History" and Walter Isaacson's "Steve Jobs."